The Morton County Sheriff’s Department has denied using concussion grenades or any equipment that could cause an injury like Sophia’s, despite witness accounts and the shrapnel recovered by surgeons from Sophia’s arm. 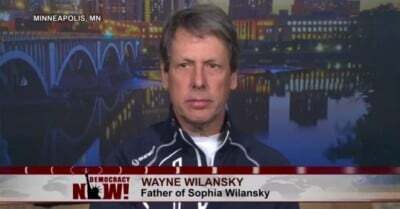 Wayne’s words were echoed on Democracy Now! 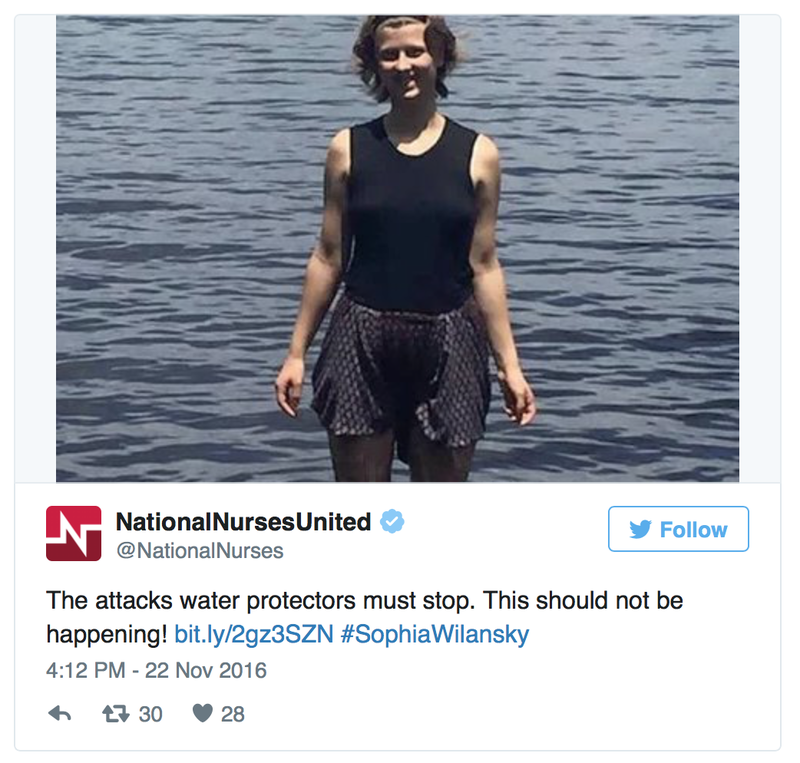 by Brandi King, a U.S. Army combat veteran and fellow water protector who helped transport Sophia to the hospital. Sophia’s prognosis was made far worse by the fact that ambulances couldn’t breach the police blockade of a main access road, which water protectors were attempting to clear when they were attacked by the Morton County Sheriff’s Department, said Wayne. Because of the blockade, it took over six hours for Sophia to finally reach the hospital in Minneapolis where she is undergoing multiple surgeries now, her father said. The harrowing delay very likely caused additional harm, Wayne added, because “every minute counts” with an injury as severe as Sophia’s. And Sophia’s injury was no accident, Wayne said. Sophia fears that the pipeline company, Energy Transfer Partners (ETP), is going to kill her, requesting that her father stay by her hospital bed to protect her, Wayne said. ETP head Kelcy Warren also told reporters early last week that he had offered to “reimburse” the government of North Dakota and Morton County for the costs of the militarized police force, but government officials denied receiving such an offer. Sophia was […] waiting to go to surgery. And they’re basically keeping us prisoner inside her hospital room, waiting for a warrant, which never came. They didn’t tell us what they were there for, for many hours. Eventually, I got to speak to a supervisor and learned that what they were looking for was her clothing. And I did eventually consent. I had taken her clothing back to my hotel room the night before, and I did consent to give them the clothing, eventually, after talking to the supervisors. I have an unwritten agreement, but I put it in writing anyway, that they will give me access to those materials so that I can test them, as well, and that they’ll preserve and not destroy that evidence, because I would want to see it, and I would want to have it forensically tested myself. One FBI agent was wearing a jacket identifying him as a member of the Joint Terrorism Taskforce, the broadcast observed. And despite the tragic result of the road blockade in Sophia’s case, the Morton County Sheriff’s Department apparently are now seeking to reinforce it by building a cement wall across the highway, water protectors said Wednesday. In the wake of what the Indigenous Environmental Network condemned as “crimes against humanity” by the Morton County’s Sheriff Department, the global outcry is growing. A multiracial delegation of over 100 frontline community leaders are traveling to North Dakota and joining the Standing Rock Sioux Tribe in their fight; a fundraiser for Sophia’s hospital bills has been flooded with donations; and even mainstream outlets such as the editorial board of the New York Times and the hosts of the daytime talk show The View are urging President Barack Obama to take action to reroute the pipeline and protect the Standing Rock Sioux tribe and its supporters. Yet Obama is swiftly running out of time to act, and observers fear that the brutality of the Morton County Sheriff’s Department in North Dakota may be a harbinger of what’s to come under the looming Donald Trump administration.